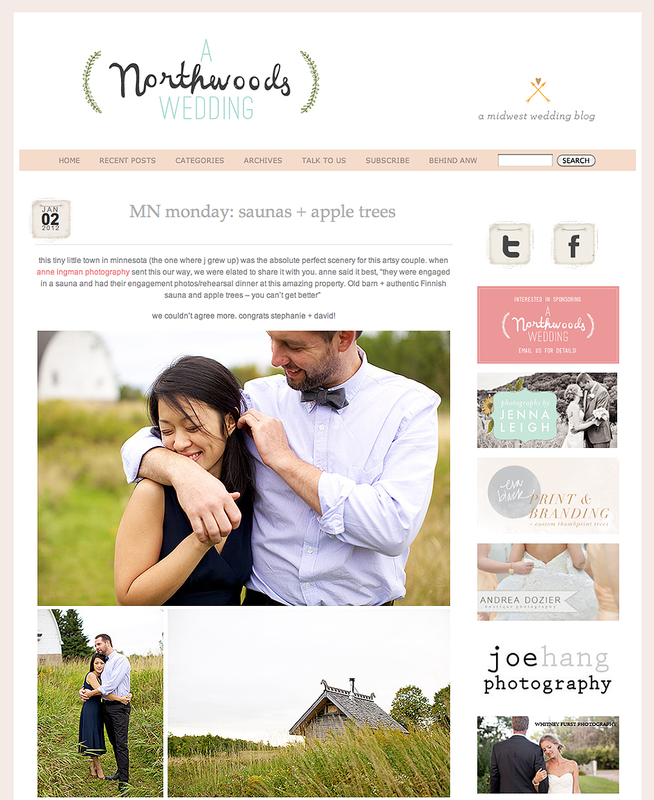 Love the ladies at A Northwoods Wedding – their enthusiasm is authentic and contagious! Recently, they featured Stephanie and David’s engagement/rehearsal photos. Did you know that Jenna (from A Northwoods Wedding) is actually FROM Esko, Minnesota! Such a small world…well, in the Midwest anyway! Thanks so much, Jenna and Britt! I asked Stephanie and David to share a bit more about their rehearsal and wedding, here is what they shared: “Our wedding venue could not have been more appropriate. David proposed in a sauna which made Hemlock Preserve in Esko, Minnesota an easy choice. We wanted to welcome our family and friends to a place that was distinctly Minnesotan. The dairy barn converted into an event space accompanied by a Finnish wood-fired sauna provided a simple and comforting welcome to our weary wedding travelers. In total we had 60 guests which was the perfect amount to fill the barn loft for the dinner. Food was catered by B & B in neighboring Cloquet, MN which Hemlock organized. Stephanie’s aunts provided the traditional Indonesian delicacies for dessert. The venue lent itself towards simple decor with the focus on sharing this time with our guests. Flowers were re-used the next day for the wedding. Anne Ingman’s stunning photographs captured the ‘feeling’ we had that afternoon, finally being able to relax and enjoy our time with guests after months of anticipation. After the dinner, the sauna was ready which offered a unique memory for us and our friends.” Thanks Stephanie and David!